The event is also a day earlier than past years, making the convention even longer. Surprise! 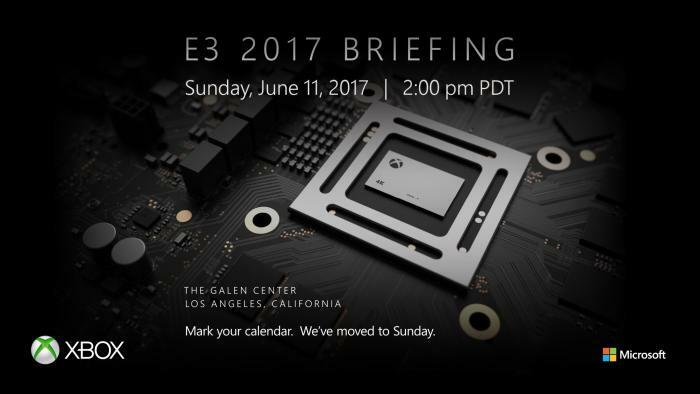 Microsoft is holding its E3 2017 press conference a day earlier than usual and the big announcement should have something to do with the company's upcoming hardware, Project Scorpio. OK, that's not a surprise, but the fact that the company is holding it briefing at The Galen Center in Los Angeles on Sunday, June 11 - a whole two days before the show officially starts - is noteworthy. The day before E3 begins is usually full of pre-show events, traditionally starting with Microsoft in the morning, ending with Sony at night, and peppered with EA, Ubisoft and Bethesda somewhere in between. It is not clear from the tweet why Microsoft is moving the event up a day. It could have something to do with the reveals - and based on the image with the tweet, Scorpio will be a big part of the presentation. Monday could conceivably be devoted to hands-on time, excess interviews or even more reveals. In late January, a report on hardware specifications leaked for Project Scorpio, which is expected to be the next upgrade to the Xbox One. The report detailed how developers could best harness the increased power of the new hardware. Microsoft has maintained that Scorpio will be "the most powerful console ever made." E3 is slated to begin on Tuesday, June 13, and run through Thursday, June 15, at its traditional Los Angeles Convention Center location. This will be the first year that E3 will be allowing the public to attend the event. Tickets are already on sale.